A few months ago we developed a voting system for our hosts to give their friends a voice in choosing acts for their house concerts. This gets a host’s friends to “buy in” and feel a sense of ownership and pride in the series. This can turn attendees into co-promoters and make life much easier for the host. Many hosts are reluctant to take the steps required, but for those who try it, we’re seeing some very successful concerts. Here are the reviews from Catherine’s first house concert. A phenomenal show by Moody Little Sister! This was our first house concert and already the bar is set impossibly high. MLS totally connected with everyone. They had our audience hooked from the opening song to the last, and we all loved the storytelling in between. The evening ended with cheers and a standing ovation, well-deserved. Do yourself and your friends a favor and book Moody Little Sister! You won’t be disappointed. We’d love to have them back anytime! And they are superb house guests. Beautiful setting, gracious and amazing hosts, wonderful listening audience.. Organized and thorough which helped us have a successful evening .. but more importantly it helped everyone have a great experience as a whole.. things ran so smooth and professionally, you would think Catherine and Michael had been doing this for years. This is everything you could want from a house concert experience. So thankful and honored to have been their first artists! How to use the voting system. 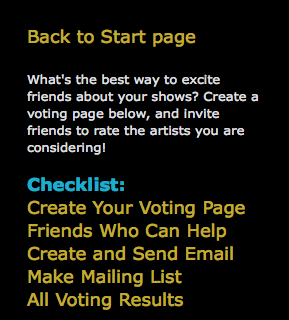 CIYH member hosts (new or experienced) can login, click “My Artists” in the left menu, and see the Voting Menu in the left column.